Our popular 3for2 offer is back this month. Order two blinds by the end of January 2019 and get a 3rd blind FREE. 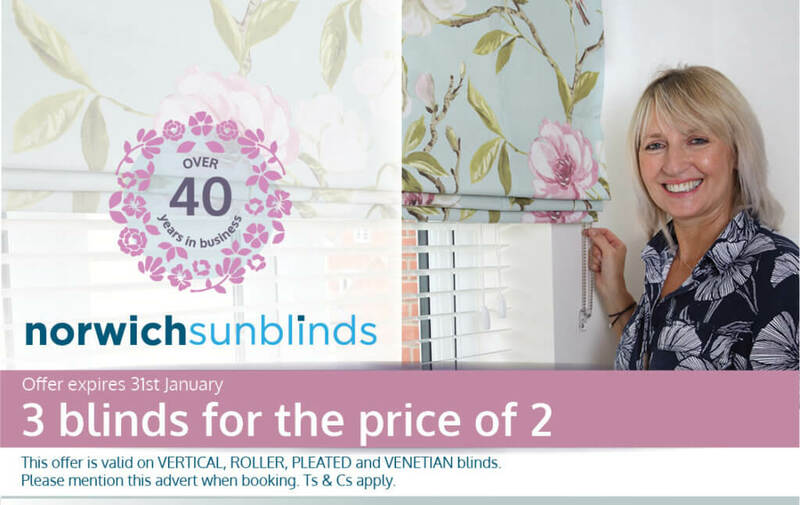 Offer applies to vertical, venetian, roller and pleated domestic blinds. Make sure you book your in-home appointment in time to get your quote and make your order. We visit you at your home to take measurements, show you fabric samples, discuss practicalities relating to your room, and then send you a quote. Our blinds are made here in Norfolk with fabric and parts sourced from the UK where possible. You have a huge choice of fabric, including some brand new designs (including Disney, Marvel and Star Wars designs). Once your blinds are made to order we fit them for you, saving you the hassle.